Welcome to Modelljärnvägens Hus & Frida Lovisa’s Trädgård, two activities we run at our farm in Söderby outside Alunda in Uppland. In the summer of 2005 our model railway exhibition opended in the renovated barn. Since then much has happened. Come and enjoy the model trains and our garden! 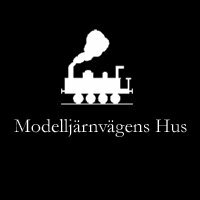 On our model layout ”Nordland” we want to show a selection of all the different trains running on the real railways every day. It can be anything from long ore trains to short commuter trains. Most of the trains are Swedish or Norwegian models, but you can also see more of Europe’s high speed on our model railroad. The model railway is at the scale of 1:87 (H0). About half of the trains can you drive by yourself! Next to the café’s outdoor seating is ” The Garden Railway”, a large model railway in scale 1:29 with American locomotives and cars. On the 150 sqm large model railroad we have laid the tracks among the summer flowers and perennials. See how the big toytrain winds its way around the blooming landscape, through tunnels and over bridges. In connection to the exhibition you will find our shop where you can buy figures, cars, buildings landscape materials, locomotives and waggons for your own model railroad. We are a reseller for several major manufacturers of modeltrains and furthermore also have books and magazines in the shop. Be inspired or nostalgic thinking back. In the shop, we also sell a DVD of our exhibition. Here you can view the various modeltrains from different angles that you might not have seen before. The narrowgauge model railroad ”A Winter World” with theme from the Alps we built to show how much model railroad you can fit in only one square meter. On the small shelf layout you can see and hear the locomotives and the railcars that were common in the 60’s. Come and see what you can do with an area that in previous generations been a cow pasture. Grandmother Frida who lived on the farm during the 1900s gave her name to ”Frida Lovisa’s Garden” which we created next to the cafe terrace. In the whole garden there is growing perennials, herbs, wildflowers and various ornamental grasses from our own garden center. Listen to the sound of the streaming water running through the garden, to the pond. When the exhibition is open you can drink coffee and eat a sandwich or homebaked cake in our cafe which is next to model railways. On a warm summer day, it is nice to cool off with an ice cream on the patio. A day when it rains maybe it feels better to drink something warm at a table indoors. Söderby, a few kilometers south of Alunda. From Uppsala, choose road 288 towards Östhammar. After 35 kilometers you will see our sign ”Modelljärnvägens Hus”. Turn of the road and you will soon be there. You will find our opening times and other information on our homepage. Is there any other questions, please send an e-mail or give us a call.